An iconic American brand and an instantly recognizable image, Fender guitars have been at the forefront of popular music from '50s rock and roll and blues, through the psychedelic sound of the '60s to '70s funk and '80s disco, to the grungy grunge of the '90s, to the twang of today's country stars. The Fender Guitar Company is currently 71 years old and shows no signs of slowing down as popular models including the Stratocaster and Telecaster keep rolling off the shelves of music stores and guitar shops everywhere. Leo Fender was the man behind the curtain, the wizard who made it all happen. Born in 1909 on his parents' farm in California, graduating college with a degree in accounting, and having never played the guitar, Leo Fender would probably have been the last person anyone would suspect of innovating the guitar industry and founding one of its top companies. Upon discovering his uncle's homemade radio, however, Fender also discovered his love for sound, electronics, and tinkering. Ultimately, working with his partner George Fullerton, he produced the first Telecaster in 1946. This guitar is considered to be the first mass produced electric guitar. In 1948, the new and improved Stratocaster came about with its sleeker, more attractive design and third pickup for extra sound, volume, and tone. For many years, especially from the 1950s through the early '70s, the quality of Fender guitars were rivaled only by Gibson, the other leading American guitar company. The craftsmanship, playability, and consistency of the instruments, as well as the great look of the guitars, are the main reasons so many next level musicians prefer Fender. The company briefly relocated to Mexico in the early '80s and at that time, it tried a different design to hold the guitar together, which was not as successful as they had hoped. After new management took over in 1985, Fender returned to to Leo Fender's earlier designs and started issuing vintage models to much success. Curious about famous and outstanding guitarists associated with the Fender brand? How about Buddy Holly of the famous Buddy Holly and the Crickets, Jimi Hendrix from the Jimi Hendrix Experience, or Eric Clapton from Cream, Blind Faith, and Derek and the Dominoes? Perhaps Tommy Bolin from the James Gang and Deep Purple suits you better? Seriously, the list of simply amazing rock, pop, blues, country, and even jazz guitarists who play, perform, and record with Fender is just about endless. Fender also makes terrific bass guitars. As the great producer Quincy Jones said, "Without the Fender bass, there wouldn't be no rock and roll and no Motown either. The electric guitar had been waiting since '39 for a partner. When the rhythm section became electric it changed everything." Leo Fender's first model has come a long, long way since 1946. The basic design is the same, but the electronics and sound are vastly improved. One of the main differences between the Tele and the Strat is that the Tele does not come with a tremolo arm or "whammy bar." The whammy bar is used to make exaggerated vibrato sounds and runs, which is more characteristic of a soloist or lead player such as Jimi Hendrix or Eddie Van Halen. So often, Telecasters are the preferred choice of rhythm guitarists. The telecaster starts in the $500 to $600 range. For more information on the Telecaster and to do some price shopping and even purchase an instrument, visit Sweetwater. The Telecaster's big brother is, of the course, the Strat. With the cutaway on both sides and the aforementioned whammy bar, this axe is made for guitar slingers who want to crank it up to 11 and wail, as well as serious musicians who can play all the chords and riff with the best of them. Another main difference again is the inclusion of that third pickup, offering more tone options for the player. The standard Stratocaster is in the $600 price range. Happy Strat shopping! Fender also produces the Jazz Master, Mustang, Jaguar, and Duo-Sonic electric guitars. Nirvana front man Kurt Cobain was a prominent musician who enjoyed playing the Mustang and the Jaguar. These related guitars are all similar in appearance, slightly more utilitarian in design, and they are quite unique instruments. They all come with tremolo arms, and most models seem to feature two pickups instead of three. They range in price from $500 to about $2,000. If you're really looking for something different, try the Fender Starcaster, a semi-hollow body guitar, and the only make and model that will run you a cool $700. Visit the Fender shop for more information or to purchase. 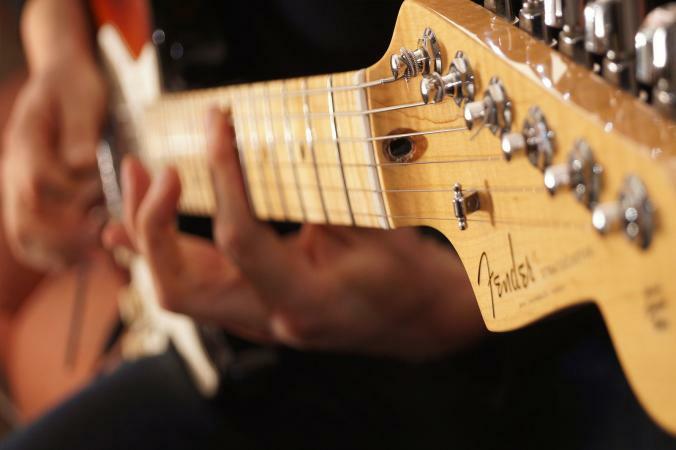 If you're seeking a beginner instrument for yourself or a family member, the Squier family of Fender guitars, made by Fender to offer quality instruments, offers the less expensive version of the Tele and the Strat, and they are usually bundled with a soft case, some picks, a strap, a cable, an amplifier, and even in some cases a beginner lesson book or DVD. Those kinds of deals are usually pretty painless, to the tune of $200 to $300, and they are a great way for a student or beginner to start the process and get the general idea of the Fender sound. Squiers are not the same level of quality as Fenders, but with a decent amp and a little practice, it's a solid start for beginners. There's nothing quite like the Fender sound, the sound the great American inventor and entrepreneur Leo Fender provided. Played clean straight through a tiny amp or with sound effects and a wall of amplifiers, the sound of these wonderful guitars and basses is an enormous part of the soundtrack of music the world over.